How to test your application with 5 users before you launch! Building a successful digital product in 2018 means developing products with your users and customers in mind. 89% of customers will switch to a competitor if they are not happy with your service or digital offering. But the good news is: You only need to test your digital product with 5 users before you launch. Only 5 user tests help you identify most major usability issues and, therefore, help you build better products. Some companies think that conducting user tests and usability studies must be very complex and costly. Or that user tests require project budgets and plenty of time scheduled at the end of a project. The best results come from testing no more than 5 users and running as many small tests as you can afford. 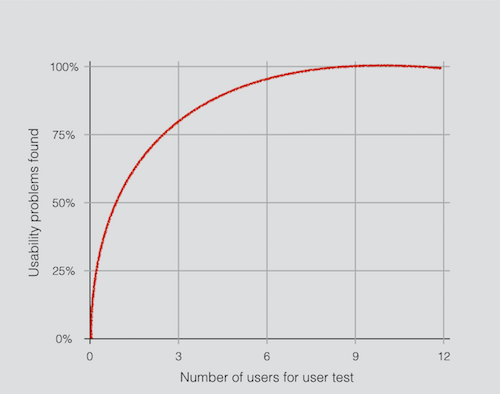 In a research study from 2000, Jakob Nielsen and Tom Landauer found that you only need 5 users to test your application in order to identify 75-99% of all usability problems. You only need 3 to 5 users to identify the majority of usability issues. That’s what I call great news! After the fifth user, you are wasting your time by observing the same findings repeatedly but not learning much new. To sum things up, you are able to identify most design issues, bugs, and user experience glitches of your website or application just by conducting 5 user tests. Although you might feel that asking 5 users for feedback does not require that much of a preparation, we recommend following these steps to plan, set up, execute and analyze your user tests. In a first step, you might wonder where you can find these promising 3 to 5 users, right? Look in the places where the kinds of people you’re looking for tend to congregate. This means: If your application aims to manage a Yoga teacher’s schedule, you probably should visit a couple of Yoga places in your city. If you’re targeting an audience that might not be in the same location, you might find potential users and customers in different online communities, social networks or work groups. Once you’ve collected a couple of interested users for your user test, you should screen them. Are they available for a test day? Do they get compensated? Communicate clearly if so or not. If you feel that someone is a good fit, schedule an appointment (face-to-face or virtual). Last but not least, you need to organize your user test. Are you conducting virtual user tests, or are people coming into your office for a face-to-face user testing session? Or are you conducting user tests on-site? Testing labs can provide some nice perks. The truth is that chances are high that you don’t need an expensive test lab or fancy tech equipment. Virtual user tests can have various advantages. Especially, when you might target a global user base, conducting a virtual user test is the only option for you. However, there are a couple of things to keep in mind, when conducting virtual user tests. Are you able to record a screencast of your user’s screen? Is it possible to record your audio, as well as the participant’s audio? In which setting/environment is the participant in? Are you able to give instructions and create an environment via a virtual conferencing software? If the answer to these questions is “yes”, you’re good to go for a virtual session. Otherwise, I’d recommend conducting real-life user tests, as it would allow you to influence the environment in an easier way. The success of your user test mostly depends on asking the right questions in the right way. You want to end up with results you can trust and results that you can comfortably base your decisions on. Here are a few tips that allow you to ask the right questions in the right way. Keep them in mind when preparing your user test questionnaire. Specific questions for specific answers: e. g. Do you already use a particular software for scheduling and managing your Yoga sessions? If so: What’s the name of the software? Ask your participants about firsthand experiences: e. g. In the past week, how often have you’ve used your calendar for scheduling Yoga sessions? Don’t use industry jargon your test group might not understand: Yoga teachers might not be familiar with terms like “Do you connect your Yoga plan via API to a 3rd party tool?” It’s better to ask something like: Do you publicly share our calendar? Don’t make your participants feel dumb: If participants get lost or confused, make clear that it is never the user’s fault, rather your app’s fault. When collecting and analyzing your user test reports, your goal is to summarize your findings and prioritize the recommendations based on those findings. Watching recordings of real users helps you to identify usability issues and bugs on your site. When you watch your users as they click, tap, and type on your site, you can identify obvious bugs easily. Though, we recommend collecting quantitative and qualitative data (e.g. by collecting in a spreadsheet). Conducting user tests with three to five participants will allow you to identify the majority of your usability issues. While this is a low-barrier and a first step into user testing, a test case with a user group needs to be well-prepared and executed in order to learn and identify recommended changes. This article is brought to you by Usersnap. Usersnap helps teams gather feedback from users, website visitors or customers to improve their digital experience.